Research firm NPD has released its list of the bestselling console videogames of all time, and you may be surprised which games made it. NPD has been tracking U.S. videogame sales data since 1995 and it just recently released the list of the top selling games in that region. Among the top ten are 3 titles from the Call of Duty as well as 3 titles which are platform specific (Wii). There is only one title on the list from the previous generation of consoles, GTA3: San Andreas, that is unless you count Namco Museum, which has apparently come out on every platform known to man. No sales figures were supplied, but the list is ranked based on number of units sold. The NPD list doesn't include PC games, as the firm tracks those titles differently. It's kind of cheating that Wii Play is even on the list because so many people bought it just for the Wii Remote bundle. It's also interesting that Madden NFL 07 is the only iteration to break the top ten, but then again it was the first of the series to appear on next generation consoles. The biggest surprise is the collection of old-school arcade games like Pac-Man and Dig Dug that make up Namco Museum, which must have quietly sold a crapload of copies. 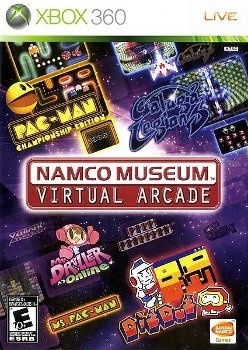 It's unclear whether NPD included every different volume of Namco Museum, but since the list specifically mentions every console, then I assume that is the case. Personally, I think that's grounds for dismissal, counselor. I should stop watching so much Law and Order.